Triggering receptors expressed on myeloid cell-1 (TREM-1) is a superimmunoglobulin receptor expressed on myeloid cells. 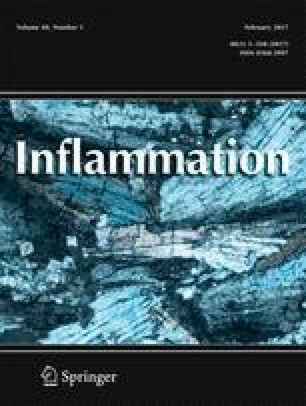 TREM-1 amplifies the inflammatory response. Epoxyeicosatrienoic acids (EETs), the metabolites of arachidonic acid derived from the cytochrome P450 enzyme, have anti-inflammatory properties. However, the effects of EETs on TREM-1 expression under inflammatory stimulation remain unclear. Therefore, inhibition of soluble epoxide hydrolase (sEH) with a highly selective inhibitor [1-trifluoromethoxyphenyl-3-(1-propionylpiperidin-4-yl) urea, TPPU] was used to stabilize EETs. LPS was intratracheally injected into mice to induce pulmonary inflammation, after TPPU treatment for 3 h. Histological examination showed TPPU treatment-alleviated LPS-induced pulmonary inflammation. TPPU decreased TREM-1 expression, but not DAP12 or MyD88 expression. Murine peritoneal macrophages were challenged with LPS in vitro. We found that TPPU reduced LPS-induced TREM-1 expression in a dose-dependent manner, but not DAP12 or MyD88 expression. TPPU also decreased downstream signal from TREM-1, reducing pro-inflammatory cytokine TNF-α and IL-1β mRNA expression. Furthermore, TPPU treatment inhibited IkB degradation in vivo and in vitro. Our results indicate that the inhibition of sEH suppresses LPS-induced TREM-1 expression and inflammation via inhibiting NF-kB activation in murine macrophage. The online version of this article (doi: 10.1007/s10753-016-0448-6) contains supplementary material, which is available to authorized users. This work was supported by the National Natural Science Foundation of China (No. 81500065, 81670014), the Specialized Research Fund for the Doctoral Program of Higher Education of China (20130162110052), High School Innovation Fund of Hunan province (15K140), and the Open-End Fund for the Valuable and Precision Instruments of Central South University (CSUCZ201632). Conceived and designed the experiments: CXG LD YZ. Performed the experiments: LD YZ TL PL. Analyzed the data: LD JXD JZ YZ. Contributed reagents/materials/analysis tools: YZ BDH CXG. Wrote the paper: LD YZ CXG. Critically reviewed the manuscript: BDH CXG.